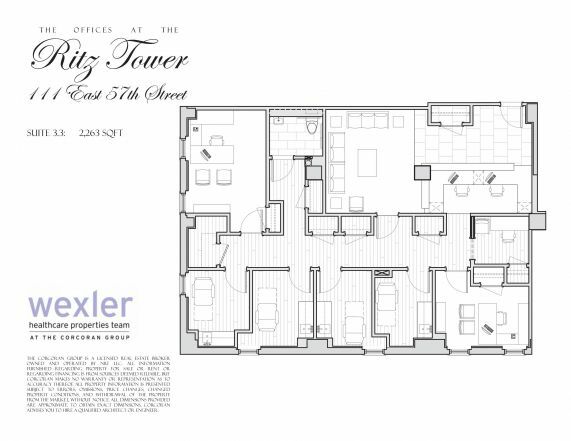 Brand new, turn-key medical suites are being built in the first four floors of the legendary Ritz Tower is situated at the doorway to the Upper East Side, at the corner of Park Avenue and East 57th Street. The entrance to the building is through a gorgeous wood paneled lobby, exclusive to the medical tenants, and served by full-time staff.The Ritz Tower medical suites, are newly constructed with modern, yet classic design, created to allow move-in with no construction required for the tenant - just plug-and-play.The building offers 15 suites, ranging from 475 square feet for solo physicians to 3,300 sq feet for multi-provider practices. The Ritz Tower suites are suitable to any specialty.